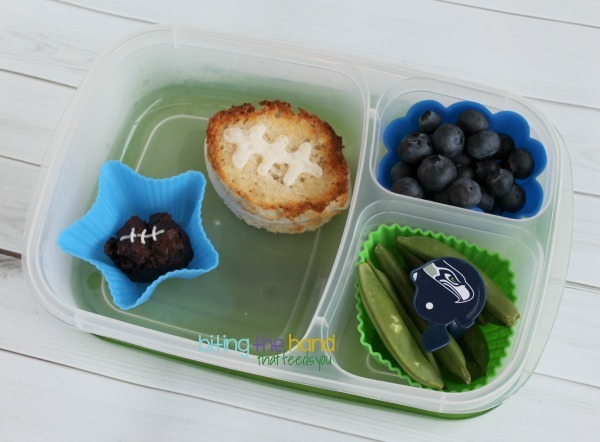 I made my 1st Grader a special lunch for Blue Friday and the upcoming Superbowl! Not that she is aware of much more than an upcoming visit to her favorite Auntie's house this Sunday! I was able to make a football-shaped sandwich using one of the larger circles in my circle cutter set - just make a circle (or most of one!) and then move the cutter up until the sides intersect the sandwich in a football shape! Easy as pie! I used a knife to cut some goat cheese scraps to make the stitching, and placed them on after I flipped the sandwich over in the oven. I used mayo instead of butter on the bread for the first time. She loooooves mayo, so it's sure to be a hit! 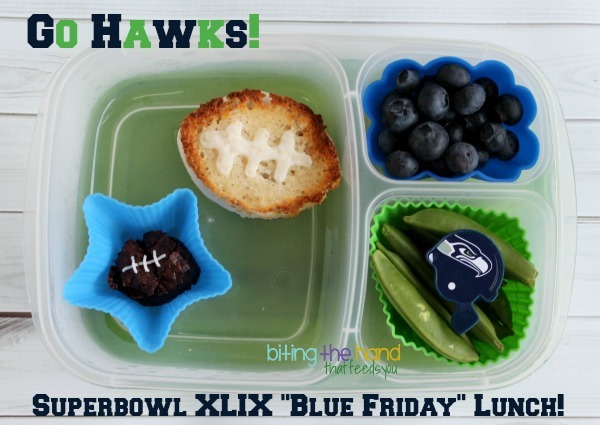 I stole this Seahawks cupcake ring off a cupcake that was up for grabs at the school PTSO meeting this week - since it was covered in fake colors and filled with gluten, I left the cupcake for someone else to enjoy. There were also some vegan gluten-free brownies at the meeting, so I took a few home and used the same technique as the sandwich with a smaller circle to make a football shape there too. This one's smaller because it's under-inflated. *wink wink* (Oh, yes, I went there!) I had a little leftover dairy-free "buttercream" icing my sister made for us, so I put a bit in a sandwich baggie, snipped a tiny opening in the corner, and piped on the stitches!